Feud is an American 60 minute scripted drama television series, which kicked off on March 5, 2017, on FX and is broadcast every Saturday at 21:00. The show is currently in its 1st season. FX has officially confirmed the renewal of Feud for Season 2. The exact release date is yet to be announced so far. Sign up to track it down. 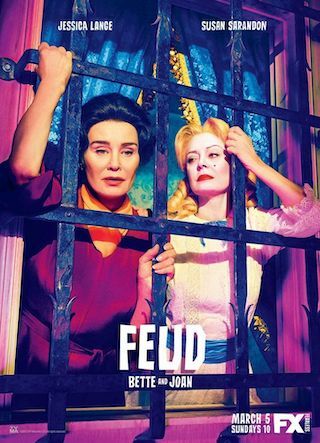 Feud: Bette And Joan, the first installment of the new FX anthology series from Ryan Murphy, tells the story of the legendary rivalry between Joan Crawford and Bette Davis during their collaboration on the Academy Award®-nominated thriller What Ever Happened to Baby Jane?, and well after the cameras stopped rolling. The series explores how the two women endured ageism, sexism, and misogyny while struggling to hang on to success and fame in the twilight of their careers. February 28, 2017 - Award-winning producer Ryan Murphy's highly anticipated new anthology limited series FEUD: Bette and Joan does not premiere until this Sunday, March 5, but FX announced today that is has already placed a 10-episode order for the second installment of the FEUD franchise, FEUD: Charles and Diana.